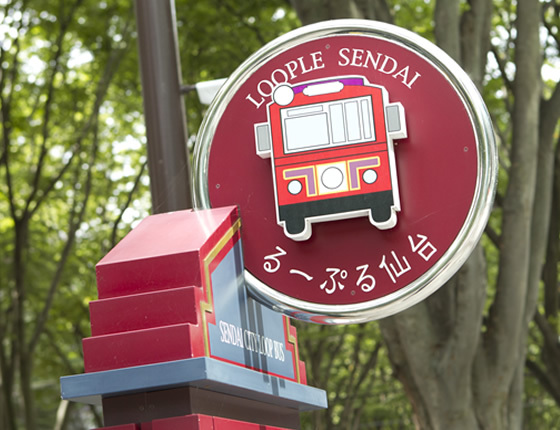 Loople Sendai is a bus that makes a loop through the tourist spots in central Sendai. Use it any way you like, from enjoying the sights of Sendai through the bus window, to exiting the bus at your tourist destination. Enjoy your visit at your own pace, by taking a quick tour or by going slowly and leisurely. Also, by buying a One-day Pass you can ride as many times as you like, as well as get special offers at facilities along the route. 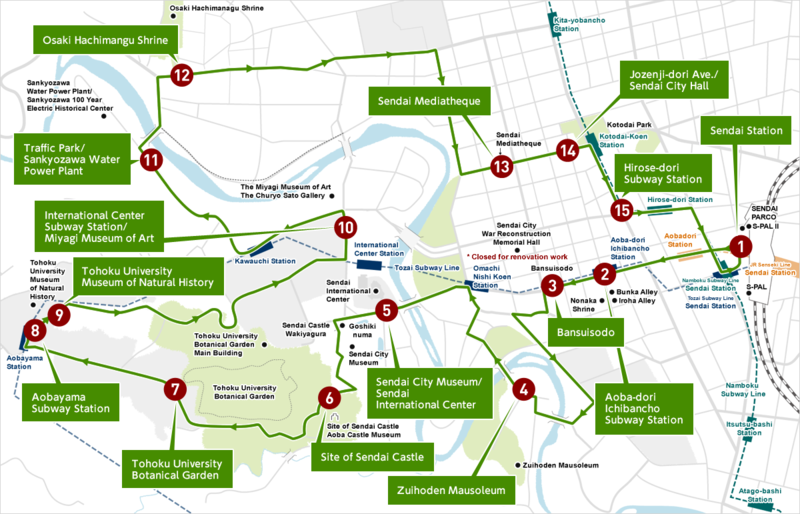 Please make the best of your visit to Sendai by using the Loople Sendai. 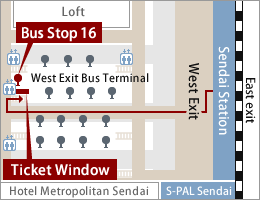 Loople Sendai can be boarded at the starting point, Sendai Station, from the West Exit Bus Pool Stop 16. After leaving Sendai Station's West Exit, go down the Bus pool stairs, and look for the red bus stop with the Loople Sendai mark on your right. Buses run between 9 a.m. and 4 p.m. Buses run every 20 minutes, and every 15 minutes on Saturdays, Sundays and National Holidays. ※Buses run every 15 minutes throughout August. ※Buses leaving Sendai Station from 3 p.m. onward go around the whole route and end at Sendai Station. 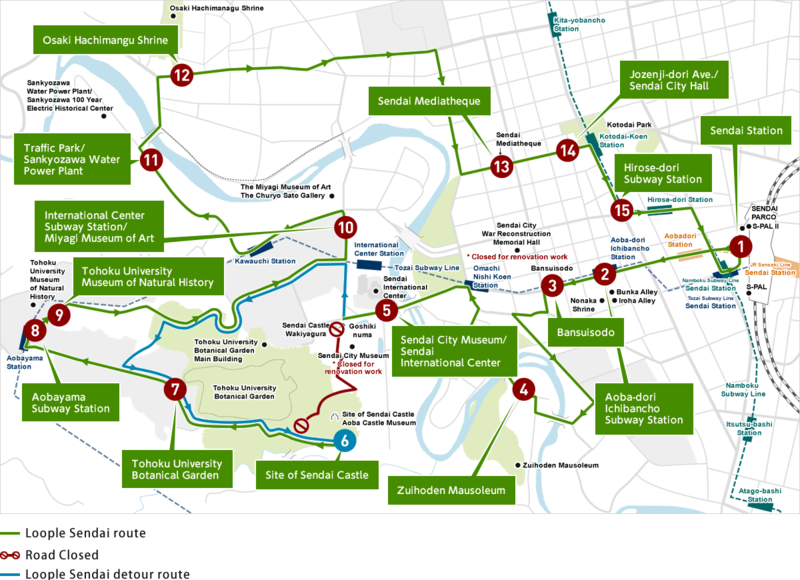 Please be aware that you cannot ride past Sendai Station for another loop on buses that are blue on the bus timetable. Please get off at Sendai station and ride another Loople Bus. 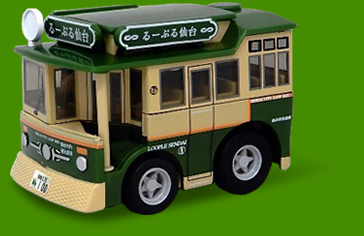 ※During busy times, buses other than the special Loople Sendai buses may be used. ※The bus only operates one way. There is no service retrun in the opposite direction. ※One-day Loople Sendai Pass cannot be used on any bus other than Loople Sendai. ※One-day Pass for Loople Sendai and Subway can be used only on Loople Sendai, Tozai Subway Line, Namboku Subway Line. ※The Sendai Marugoto Pass can also be used as a One-Day Pass for Loople Sendai and Subway. ※icsca (by Sendai City Transportation Bureau), Suica（by East Japan Railway Company）and PASMO cards, which are mutually usable with Suica, can also be used for payment of the Single-ride. Board Loople Sendai buses at the middle door, and exit from the front door. Pay the fare when exiting the bus. The first time you exit the bus, insert your card into the card reader to have the date printed. The date will be printed on the back of the card. Exit the bus while showing the date on the card to the driver. Pay in cash when exiting the bus. Change can be given for 1000 yen bills. Touch your IC card （icsca, Suica, PASMO）to the card reader. The fare is automatically calculated when you get off. If the balance is insufficient, you will need to add more money to your IC card. discounts for admission, food and drink or other special offers. Show your One-day Pass when you enter or before ordering. ※Some items are excluded from this special offer. For further information, please ask each shop. ※Not applicable to items other than food and drink. ※Payments must be in cash or by credit card. Other forms of payment are not accepted. ※Show your One-day Pass at ceremony hall. In addition to the above special offers, the following attractions that are located near subway stations offer discounts for admission. ※Closed from December to March. Economical “One-day Pass” valid for one day of unlimited rides are on sale now. Tickets can be bought from the bus driver. Please ask the driver to buy tickets only when the bus is stopped. The driver has a limited number of tickets, so please try to buy your tickets at the West Exit Bus Pool Ticket Window of Sendai Station or one of the other locations above before boarding. Tickets are sold at the front desk. Purchases can also be made by non-guests. In addition to the above locations, One-day Pass for Loople Sendai and Subway can be bought at each subway station window. The following facilities are closed on Mondays. Facilities may close or change opening times without notice. The number in the red circle is the closest bus stop. Tohoku University Botanical Garden*Closed from December to March. Sendai Mediatheque *Only the library inside is closed on Mondays. Please be aware that the museums and parks have holidays that vary during the beginning and end of the year. Please refer to each facility's website or call them for more information. 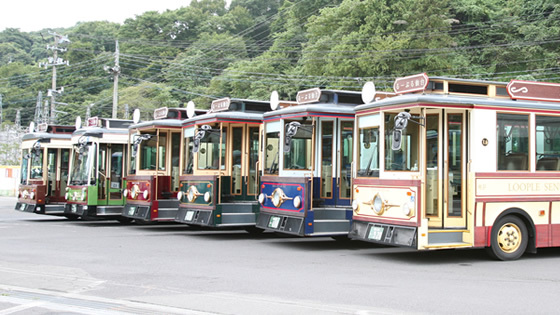 The streetcar design of the Loople Sendai buses is popular not only with tourists, but also with the citizens of Sendai. The retro color scheme is a perfect match for the leafy green cityscape of Sendai. The Loople Sendai Buses are barrier free. (They have equipment that cater to those passengers with wheelchairs.) There is plenty of space in the aisle, and each bus has a ramp entrance or wheelchair lift. Feel free to tell your driver when you want to use them. ※Some tourist spots have slopes or steps, so please check before visiting. Sendai Free Wi-Fi can be used at Loople Sendai buses and bus stops. 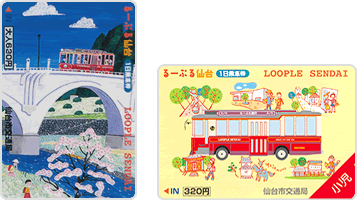 We sell Choro-Q versions of the retro tourist bus Loople Sendai. They are available only within Sendai, so please buy one as a gift or souvenir of your trip on Loople Sendai.